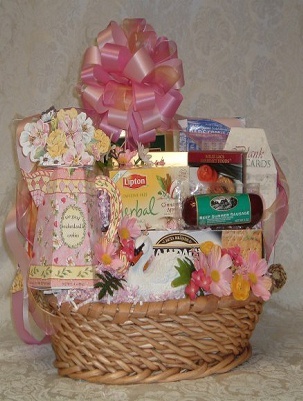 This lovely basket of comfort foods will let them know you are thinking of them. Basket contains: 1 box of gourmet chocolate drizzled popcorn, 1 bag of Dad's scotch oatmeal cookies,1 box of crackers, cheese & sausage. 1 box of snickerdoodle cookies, 1 box of herbal tea,1 box of mixed nuts, 1 bag of chocolate covered pretzels, 1 bag of fruit chews, & a box of decorative note cards.